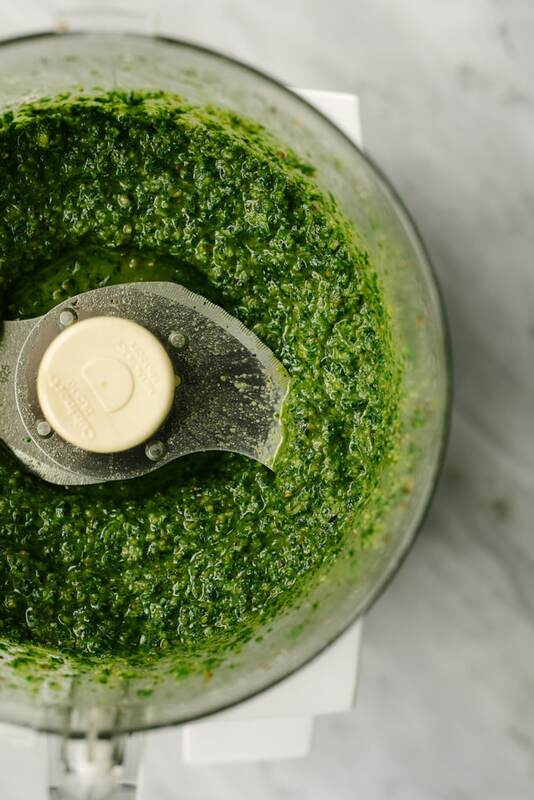 This vegan, paleo, and Whole30 compliant parsley pesto is literal awesome-sauce. It’s fresh, tangy and bright, and goes with almost everything. It’s my go-to winter condiment for grilled protein, roasted potatoes or vegetables, a crisp peppery green salad, and so much more. Best of all, it’s ready in just 10 minutes. We all have those crazy hectic nights where our dinner plans go to absolute garbage. You forget to prep your slow cooker stew, aren’t in the mood for that Instant Pot recipe, or just need to get something on the table in 20 minutes because the kids are hangry and you have 17 loads of laundry to do after dinner. I’ve been there (recently). It seems an especially common occurrence during a Whole30, at least for me, and I’m guessing you’ve been in the same boat a time or two in the last week and a half. My go-to on these nights is pan-seared steak or salmon with oven-roasted potatoes and veggies. But while it’s quick, easy, and totally compliant, a simple protein + veggies dinner can be SO BORING. And that’s why today’s recipe is super freaking handy. 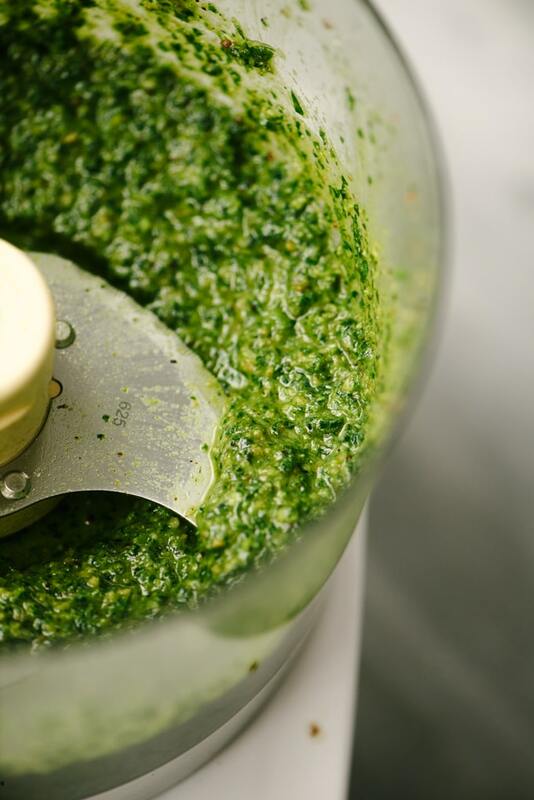 Paleo parsley pesto to the rescue! It’s a literal flavor explosion of awesome-sauce, and ready in just 10 minutes. Drizzle it over roasted potatoes and vegetables. Slather it on grilled or pan-seared steak, salmon, or chicken. Toss it with spaghetti squash for a pesto “pasta”. Stir it into scrambled eggs or a veggie frittata. Use it to dress a peppery dinner salad loaded with raw veggies and grilled protein. So many possibilities. So much flavor. I have a jar of parsley pesto in my fridge, and a back-up in the freezer, at all times throughout the winter. It’s an absolute must for me, Whole30 or not. It’s a bright, fresh condiment that will elevate the lamest of the lame grilled-this-or-that to a gourmet(ish) experience. Paleo pesto…I put that sh*t on everything. Liberally. Pin it now! 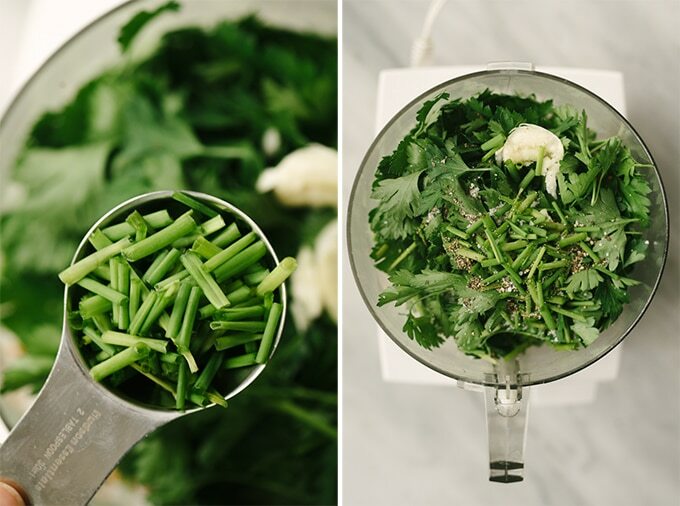 Click here to add this parsley pesto to your Whole30, Paleo, or Vegan Recipes board! Guys, this fresh, tangy condiment is ready in just ten minutes with the aid of your trusty food processor, so let’s get this flavor party started. Grab yourself a sauté pan or cast iron skillet, heat it up, and add the chopped walnuts. Get those guys all toasty and then transfer them to your food processor. Take special love and care not to burn the walnuts. Burned walnuts are gross, and we’re not in the business of gross, now are we? We’re not. To avoid that unhappy outcome, continually shake the pan while the walnuts are toasting to ensure they don’t have too much permanent contact with the pan, and that they get toasty on all sides. It should take about 5 minutes. Add the parsley, chives, garlic, salt and pepper to the walnuts. Quick note here – don’t skip the chives. Please? Thanks. They infuse a peppery, garlicky bite that makes the finished pesto simply irresistible. I’ve made this pesto with and without the chives, and the chives add an undeniable spoon-licking quality to the final product. You won’t be sorry you spent that extra buck or two. Pulse the herbs and nuts until they’re pulverized. They should be teeny tiny. Scrape down the sides once or twice to ensure you don’t miss any bigger chunks. Flip the motor to continuous and pour in the olive oil through the feed tube until the pesto comes together and the ingredients are completely incorporated. I get heavy-handed on the olive oil for a viscous, drizzle-able (is that a word?) consistency. You can use less for a thicker sauce, but don’t get too skimpy (especially if you’re Whole30-ing – you need that healthy fat!). 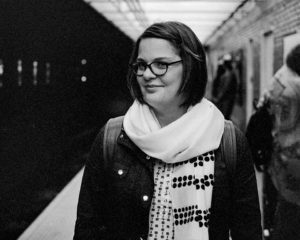 And…you’re done. Wasn’t that easy? I drizzled this batch over some crispy smashed potatoes (bonus recipe below!). Aside – these make a super fun party snack, and look so cute on a tray with some parsley pesto dipping sauce on the side. Whole30 snack situation – covered. NEED MORE WHOLE30 INSPIRATION? BROWSE MY WHOLE30 GALLERY FOR EASY, SEASONAL, DELICIOUS RECIPES! PIN IT NOW, MAKE IT LATER! CLICK HERE TO PIN THIS RECIPE for Paleo Pesto. 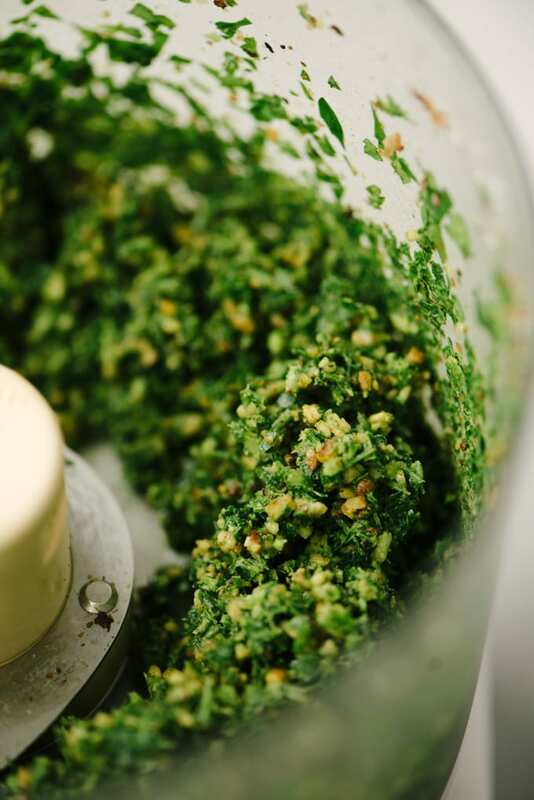 This vegan, paleo, and Whole30 compliant parsley pesto is literal awesome-sauce. It's fresh and tangy, a perfect topping for almost everything, and ready in just 10 minutes. Heat a small skillet over medium high heat. 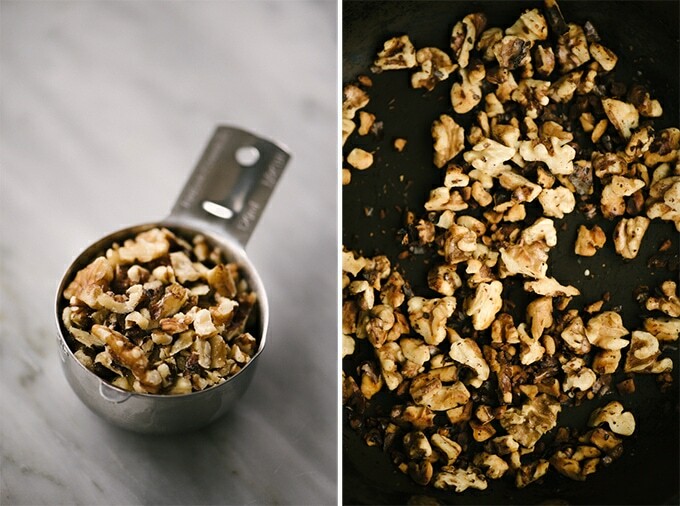 Add the walnuts and dry roast, stirring frequently, until the walnuts are golden brown and fragrant, 3-4 minutes. Be mindful that they don't start to burn. Remove the skillet from heat and immediately transfer the nuts into the bowl of a food processor. Allow the walnuts to cool for a couple of minutes while you gather your remaining ingredients. Add the parsley, chives, garlic, salt, and a pepper to the walnuts and process until the nuts and herbs are pulverized, about 10 seconds. Scrape down the sides of the bowl, flip the motor to continuous, and pour the olive oil through the feed tube in a continuous stream. Continue to process until oil is incorporated. The resulting pesto will be on the thinner side, so that it’s easier to drizzle. If you prefer a thicker pesto, reduce the olive oil to ⅓ c.
This recipe makes approximately 1 cup of pesto, and a (generous) serving size represents two tablespoons. You may need more or less per serving depending on your food delivery vehicle of choice. Sprinkle it over roasted potatoes and vegetables. Toss it with spaghetti squash for a pesto "pasta". Drizzle it over scrambled eggs. Use it to dress a dinner salad loaded with raw veggies and grilled protein. Eat it with a spoon (just kidding...kind of). 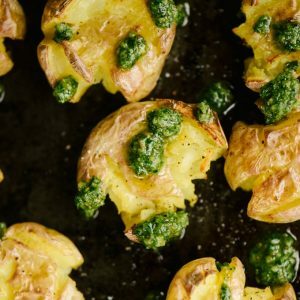 These crispy smashed potatoes go from good to amazing with the addition of drizzled parsley pesto. 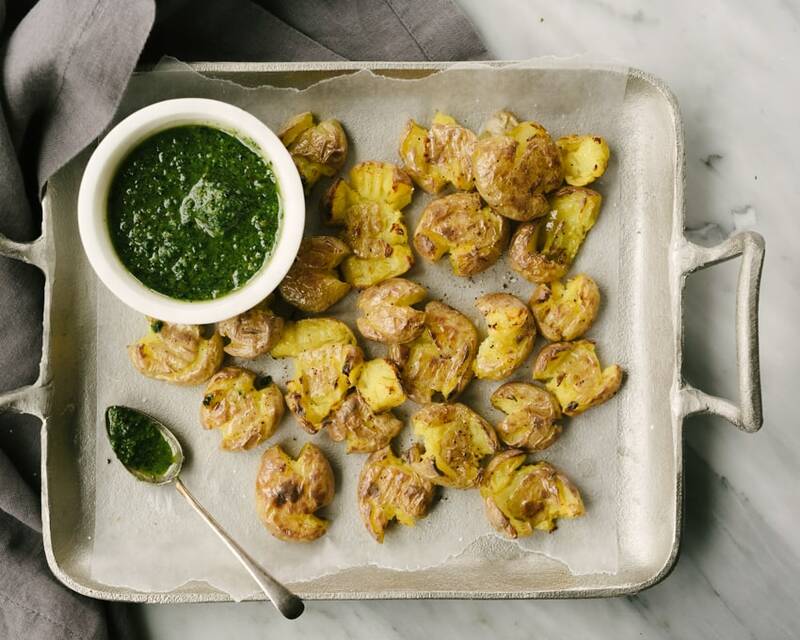 Serve them as a fun party appetizer with the pesto on the side! Place the potatoes in a large pot and cover with cold water until they are submerged by 2”. Bring the water to a boil over high heat. Once boiling, add the salt. Boil the potatoes until they are fork tender, 18-20 minutes. Position the oven rack in the top third of the oven, and preheat the oven on the “high” broiler setting. Grease a baking sheet with 1 tsp of avocado oil. Drain the potatoes, then spread them onto the baking sheet in a single layer. Using the tines of a fork or a potato masher, gently smash each potato. Be careful not to smash all the way through. Brush each potato with the remaining avocado oil, then sprinkle with salt and pepper. Place the potatoes in the oven and broil until crispy, 10-12 minutes. 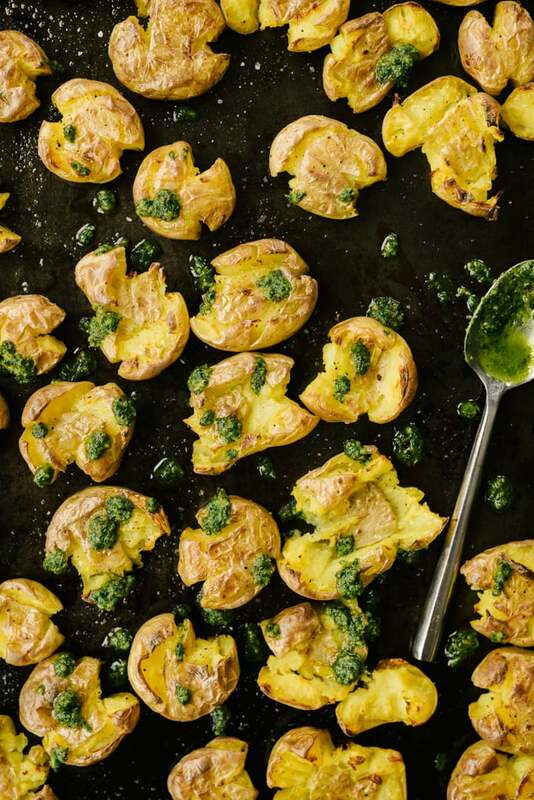 Remove from the oven and drizzle the pesto over the potatoes. Serve immediately, with additional parsley pesto on the side for dipping. 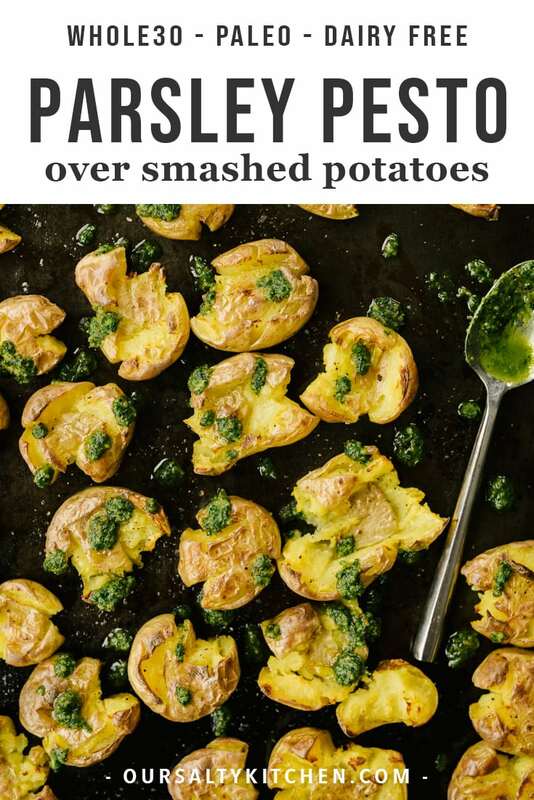 I’m super over smashed potatoes but that parsley pesto is legit. I’ll eat by the spoonful and smash some other things instead. Rutabagas and parsnips come to mind. We had it on roasted cauliflower tonight and it was…OMG. So good. LOVE this pesto. I’m doing a Whole30 at the moment and pesto is one of my favorite flavors to add to veggies or meat. So this dairy-free version has changed the game for me. The parsley gives it a vibrancy that is wonderful too! 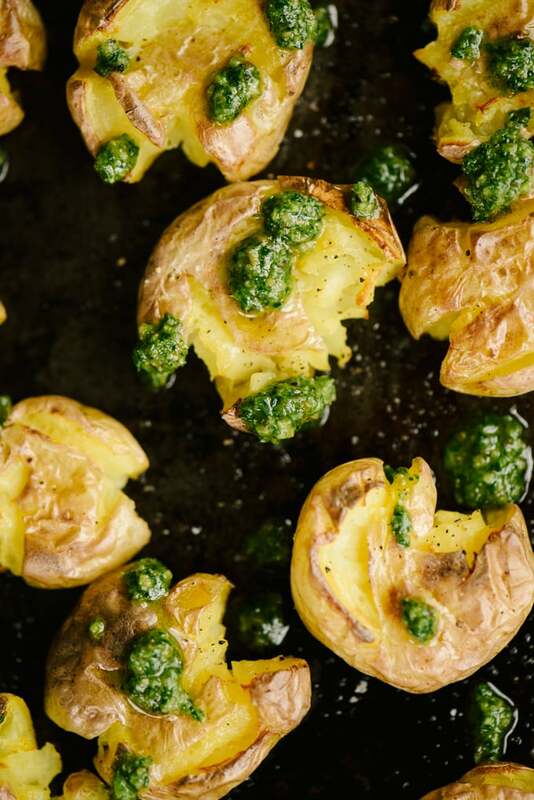 Simple little tricks like smashed potatoes with parsley pesto make me feel like a chef. Love it!